Boone had a birthday this week. All he asked for was a homemade chocolate cake. No presents, no special dinner, just cake. Sweetheart, I can do that. My guy is tired, lambing season has been rough with the crazy weather we have been having. 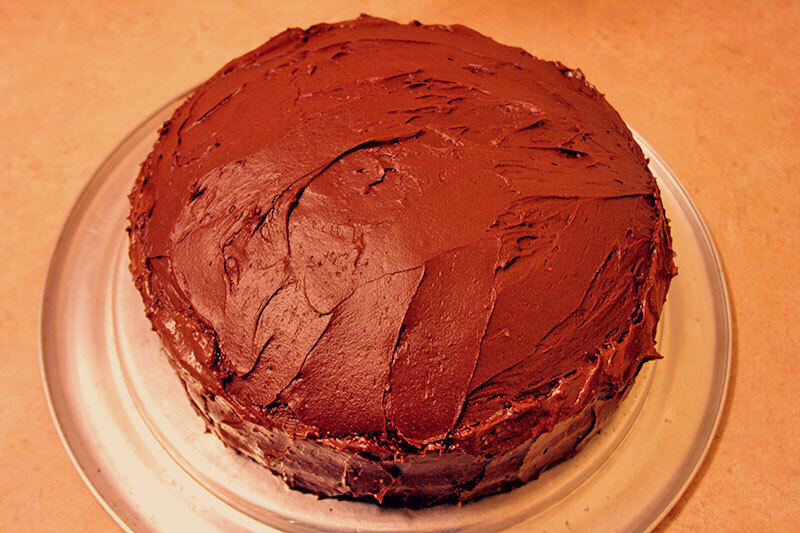 My favorite chocolate cake is an old standard – Hershey’s Collectors Cake with Chocolate Buttercream Icing. It is rich moist cake with a wonderful flavor. My mom found the recipes on the back of the Hershey cocoa tin years ago and they are my go to cake recipes. I like to get my pans ready first. To start, tear off 2 sheets of wax paper that are a bit wider than the cake pan. This is what we are lining the pan with to make the cake easier to remove after baking. Put one pan on a sheet of wax paper and trace the pan on the paper Now, with a pair of scissors, cut out the circle you just made. Repeat with the other pan. 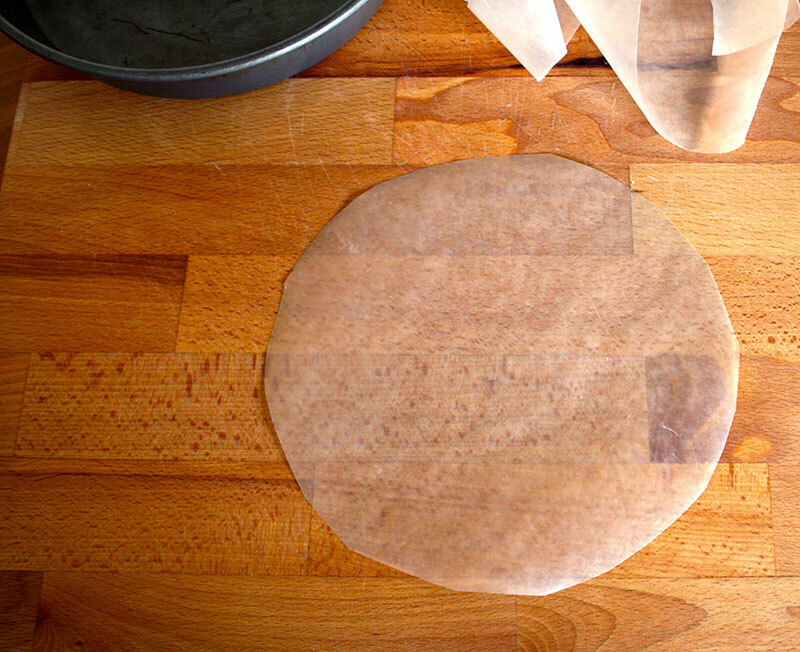 Lay the circle of wax paper in each pan. 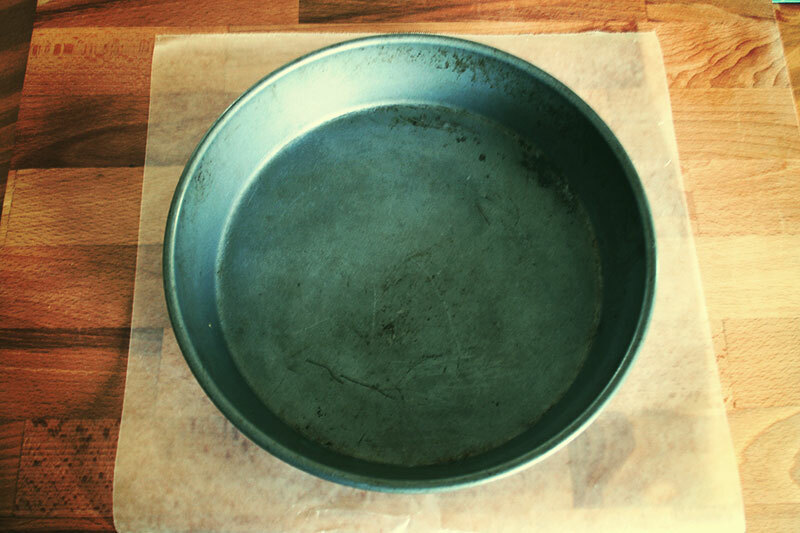 I still like to grease the wax paper and sides of pans. I tend to use whatever I have on hand, which is usually extra-virgin olive oil. Set pans aside. Cream the butter and sugar together in a bowl, beat for a minute or two until light and fluffy. Add eggs and vanilla and beat again until combined. In a separate bowl, add flour, cocoa, baking soda and salt. At low speed, add the flour mixture to butter mixture alternating with water until well blended. Pour into the pans and bake for about 30 minutes or until cakes test done. My oven runs a bit hot so at about 15 minutes I laid a sheet of aluminum foil over the pans so the cake would not get too dark. When done, let the cakes cool in the pans until the pans have cooled a bit. 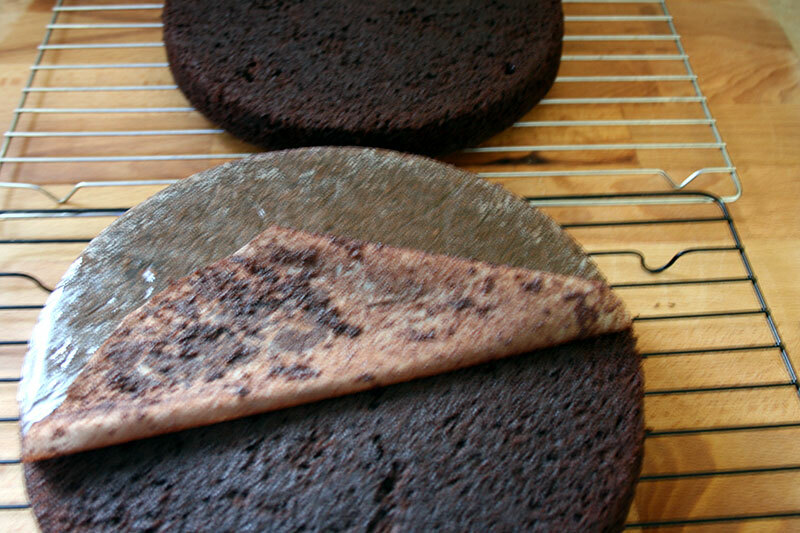 Run a knife around the edge of the cake and remove it by placing cake rack on pan and flipping the pan over on it. If needed, tap around on the bottom of the pan to release the cake. Let cool completely on the rack. I really like this Buttercream Frosting recipe as the chocolate flavor can be light or dark depending on how much cocoa powder you add. Start by creaming the butter. Add vanilla, then alternate the cocoa, powdered sugar and milk. I use 1/2 cup cocoa for a medium chocolate flavor and make 1 1/2x’s the recipe that makes about the right amount of frosting for us. 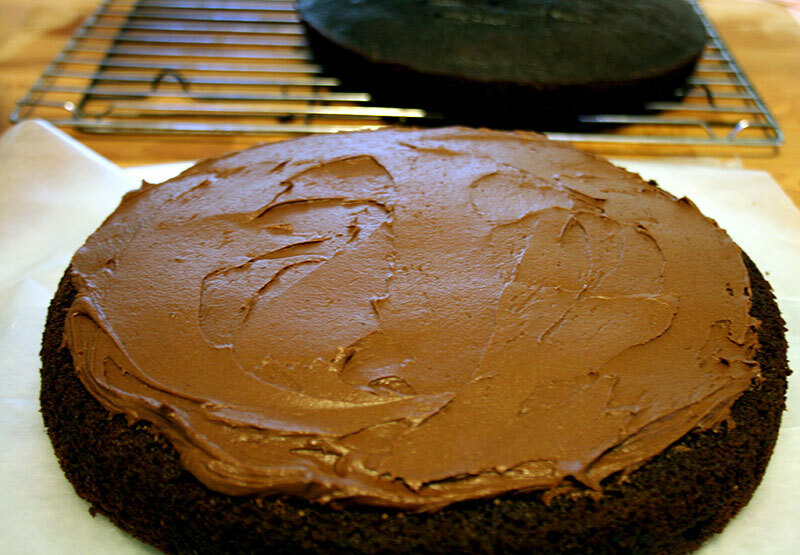 Place the first layer of cake on a cake pan and frost the top. Place the 2nd cake layer on top. I usually put the rounded dome up. Frost the top, then the sides. 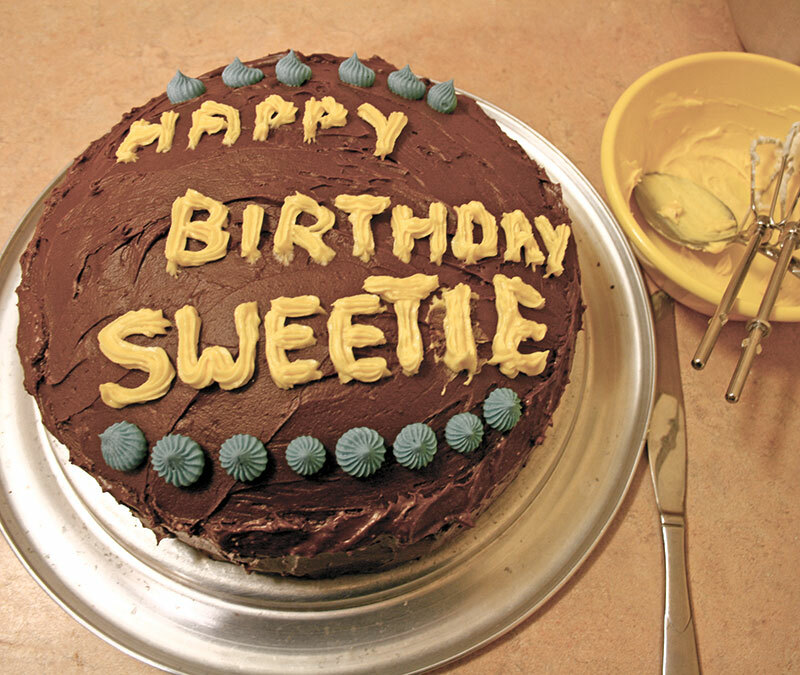 I am not cake decorator by any means but I like to add a little decoration. A simple recipe for decorator’s icing is the following: ¼ cup shortening, ½ tsp. vanilla, 2 cups powdered sugar and a few tablespoons of milk. Cream the shortening then add the vanilla. Add some of the sugar, blend, then milk, and repeat ending with the milk. Separate into bowls if you want different colors. Add a drop of food coloring to each bowl and stir it well. I do not have any pastry bags but I do have my mom’s old Wilton cake decorating kit so I use a quart size freezer bag and cut a tiny bit off a corner and then put a decorator’s tip through the hole. I put whatever color icing I am starting with in it and decorate away. Use a different bag for each color. Pour into the prepared pans and bake for about 30 minutes or until cakes test done. Start by creaming the butter. Add vanilla, then alternate the cocoa, powdered sugar and milk until smooth. Previous Post » Lambs are Here!